INDIANAPOLIS -- If you're looking for ways to help teach your child how to be more empathetic, there may just be an app for that. 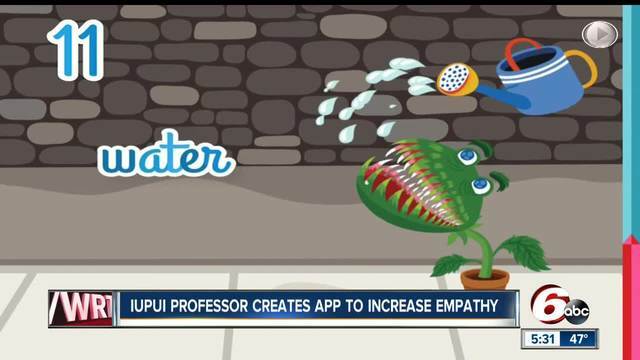 "Random App of Kindness" was created at Indiana University-Purdue University Indianapolis. The goal of their app is to get kids doing things that research has shown can help them build more empathy. Sara Konrath, Assistant Professor of Philanthropic Studies at IUPUI is an empathy expert and worked with the developers of the app. She said the group took the building blocks of learning to be empathetic and put them straight into the app. Players have to do things like try to get away from an angry person as quickly as possible, figure out what a crying baby needs and help an elderly woman cross the street. Konrath said she tested the app on kids between the ages of 10 and 17 over a two-month period and found the ones who played their game versus a standard game were more likely to help others. "Random App of Kindness' can be downloaded for free on Itunes and in the Google Play store.